Research continues to suggest that business expectations for paperless delivery adoption always exceed realized gains. Despite the efforts of bill and statement providers to move customers away from receiving paper-based communications, consumers still value the physical document as a hard copy archive as well as a reminder to pay. Americans received more than 26.6 billion household bills and statements last year. 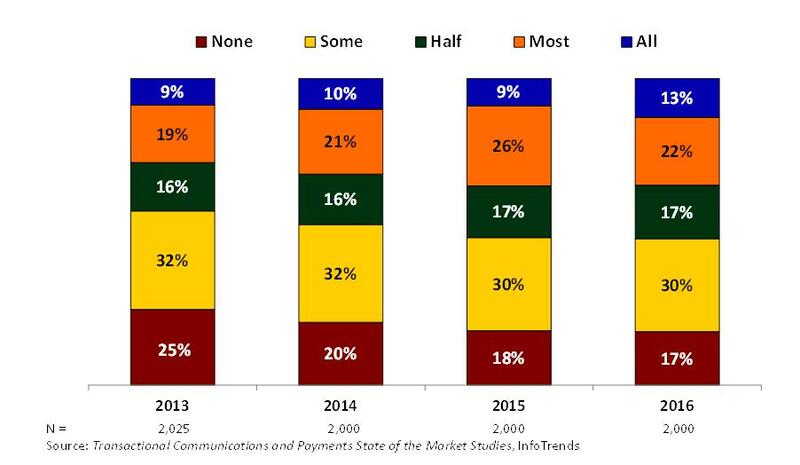 InfoTrends, a research firm that surveys and tracks how businesses print and mail communications, conducted its 2016 Transactional Communications and Payments State of the Market survey. According to the study, only 34% of bills and statements will be delivered as “paperless” this year. This may be because many consumers still like to receive their paper statements in the mailbox. For credit cards specifically, a new survey from CreditCards.com found that nearly half of today’s 93 million credit card holders that are still receiving their statements on paper instead of online actually prefer it that way. This loyalty to paper statements is encouraging… hey, we’re an envelope company! What’s more, 46% of those who are receiving paper financial statements say they would pay to receive these mailings if they had to. According to the survey, a small credit and a discount coupon wouldn’t be enough incentive for most to switch. An account credit of $50 would be enough to tip a bare majority (52%) into switching. Figure 1: Which of the following incentives would convince you to switch your financial documents from paper to e-statements? Age is a factor that affects the preference for paper or digital financial statements. For example, although only 6% of consumers between the ages of 18 and 25 receive monthly credit card statements in the mail, the same is true for 36% of those aged 71 and older. According to InfoTrends’ research, 55% of those who receive their checking and debit card account statements online also receive paper copies, while 44% of those who receive credit card statements electronically also get paper statements. InfoTrends’ tracking shows the change in this “double dipping” behavior over the past few years. Figure 2: Of the bills and statements that you access online, for what portion do you no longer receive paper versions? 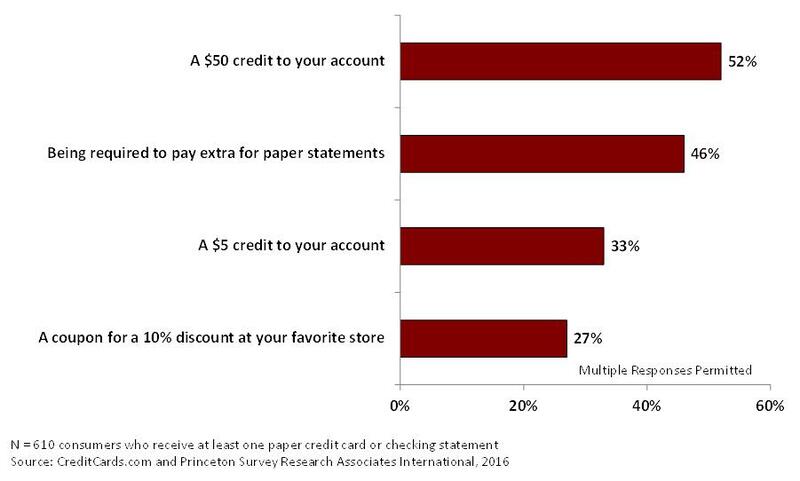 Consistent with these findings, the CreditCards.com research found that while 67% of those getting mailed statements are just used to receiving the paper statements and like it that way, 50% say they pay their bills with checks and the mailed statements supply them with the payment envelopes. 80% like to keep the paper bills for their records and 74% use the paper statements as a reminder to pay their bills. A 2016 National Consumer Law Center (NCLC) study on paper statements gives this old-fashioned payment method another endorsement. Based on this research, the practice of reviewing statements online is a major concern for the center because electronic statements are easy to overlook due to e-mail overload. The concern is that cardholders are missing out on important information such as the card’s interest rate and minimum payment information. Even worse, they might miss fraudulent charges or other suspicious activities. If consumers overlook online notifications and miss a payment, this can be harmful to their credit scores. Once again, these findings show that consumers value a physical mail piece as a record-keeping tool and a reminder to pay. Electronic statements create barriers for consumers to access vital information—consumers must set aside time to visit the correct webpage, recall their password, and download the document. According to the report, these steps take more effort than simply opening an envelope. In addition to these print-friendly suggestions, it’s important that you know your customers and their preferences. You must cater to their individual needs, whether it is paper, paperless, or a combination of both. Today’s market is more complex than ever before, and multi-channel communication will continue to be a growing demand for consumers of all ages.